Those guys always have a chip on their shoulder. His turkey twizzler was less impressive. Buy one get one freak! There's nothing more annoying than a Pop-eye in your potato. "Don't laugh else he'll give you a cauliflower ear." Derek's suffering from tuber culosis. "Alright my loves..Gourd game, gourd game"
"Do you even stack shelves bro?" Practical joker Perry is always up for a Yam-a-ha. Dave after a good veg out. To think he fights at bantam weight. In the evenings he works with buffet the vampire slayer. He should get a job at F arm Foods. And to think that he used to be such a small fry. Some potatoes can be arm full. Wow- where did they find a potato with a face like that? drink some Red Bull and you'll get the wings too. Jesus! Emu's put on some weight! 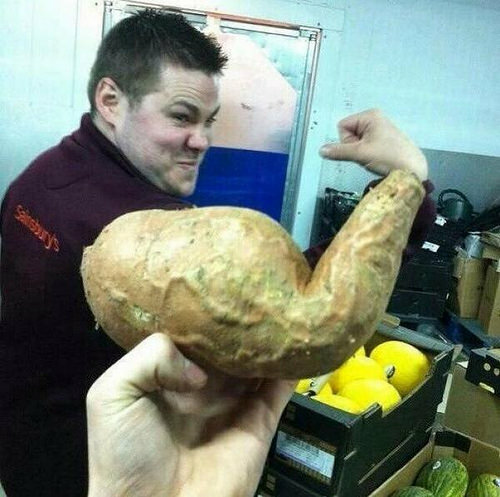 It's a little known fact that some vegetables have bicepual tendoncies.